Our food waste recycling (or food organics) service rescues your catering food waste from being thrown into landfill and converts it into high-grade compost through an in-vessel composting process or windrow composting. We can help you start your own food waste to compost program by installing our secure 120 litre containers (in either burgundy or dark green/black body with a lime green lid). We can also supply kitchen caddy bins for use in your lunchroom/kitchen areas (these bins would need to be emptied daily into the 120 litre containers). Your team will be trained to easily separate compostable food waste so you maximise your organic recycling. Reduce waste to going to landfill – landfill pose detrimental impacts to the environment including leachate, which can find its way into groundwater systems. Less waste going to landfill will extend the life of existing landfills and reduce the number of landfills required. Reduce Greenhouse Gases – greenhouse gases are produced by materials (including organic waste) in landfill. Methane generated by land filling of organic waste is detrimental as a green house gas. The carbon dioxide from aerobic composting is considered to be part of the normal biogenic cycle. Facilitate growth in other recycling – food waste takes up a large proportion of your general waste bin. The implementation of a food waste recycling system would reduce the amount of general waste you have and also make it clearer which other materials are suitable and could additionally be recycled. For example you might also be throwing away high volumes of paper/cardboard which can now easily be segregated. What can I put into my food waste recycling/organics container? 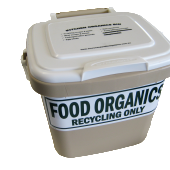 For a list of what can and cannot put into your food organics bin click here. Visit our Food Waste news section. DON’T SEND YOUR FOOD WASTE TO LANDFILL! To kick start your food waste recycling programme contact us.